Chief Electoral Office(CEO) of Karnataka has made the enrolling process so easy that you can get a Electors Photo Identity Card (EPIC), also known as Voter ID Card, by sitting at the comfort of your home. Let it be enrolling into Voters List, change of address or change of polling station, you can do all these activities online. How can I enroll as a Voter? As a citizen of India, it is your right to Vote. 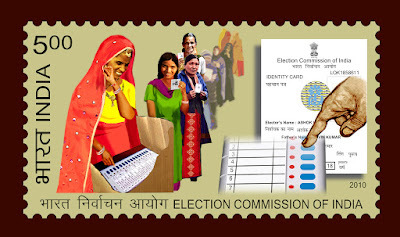 For casting Vote in their respective Municipal, State or National elections, Voter ID card can be used as an identity proof. You must have a passport size photo, an address proof and an age proof to file your application online. Go to the Voters Registration Online Portal of Karnataka and register yourself. Once registered, log in and submit Application for inclusion of name in Electoral Roll (Form 6). Make sure to generate Acknowledgement, take a copy and keep it with you. It takes couple of weeks for your name appear in the Voters List, provided you have submitted all required documents and the information provided is matching with the documents submitted. You can search your name in the Voters List by going to Search Your Name In Electoral Roll. Also you can see the status of your application under "Application Status" menu. How can I correct Name, Address and Photo in my Voter ID Card? where your name is listed are mandatory, which can be obtained using the search feature mentioned above. Please note, if you want to change your photograph in your Voter ID Card, you must write “My Photograph” in Part IV of the application. When will I get my Voter ID Card? Once your application is successfully processed, the office will print your photo ID card and mail it to the address provided in the application. In case you did not receive it, you can go to the nearest Bangalore ONE centres and provide the part number, they will print the card for you for a nominal fee. How to know my Polling Station? To know your assembly constituency(AC), polling station address and other details, SMS KAEPIC <VOTERID CARD NUMBER> to 9731979899. A sample message would be "KAEPIC AAA1234567" and the response from DZ-CEOKAR: "Assembly Constituency No. and Name: 176 - Bangalore South; Part No: 9999 - Rammanohar Lohia Law College Room No-3, Gottigere; Serial No. : 99999; Name: James Bond; C/O Andrew Bond.". Let's work together for a better, safer and cleaner India!